To any golfer who has ever been bitten by the travel bug, rattling off a list of memorable golf hot spots like the Monterrey Peninsula in California, Bandon Dunes on the Oregon coast, the south-west of Ireland or the links courses of Scotland’s east coast is likely to send them into a daydream. 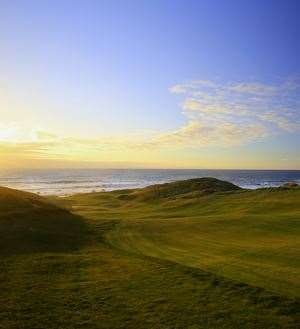 In recent years, New Zealand has also found its way onto golfers’ bucket lists, as have Barnbougle Dunes and Barnbougle Lost Farm on the northern coastline of Tasmania. Cape Wickham's spectacular par-4 18th hole. Looking forward, the next ‘it’ destination for golfers – not just here in Australia but around the world – will be King Island. Yes, that’s right King Island, where the population is somewhere between 1,700 and 2,000 people and it is most famous for its dairy as well as beef, lobster and kelp production. Located off the north-western tip of Tasmania in the middle of Bass Strait, King Island has become the focus of golf course developers enthused and inspired by the quality of the golfing land the island possesses. While the island is already home to arguably one of the best nine-hole courses in Australia, it will soon be joined by two seaside courses – Cape Wickham and Ocean Dunes – that, in this writer’s opinion, will eventually be ranked in the top-100 courses in the world. And I wouldn’t be surprised if that goal is reached sooner rather than later. Construction is well advanced on both courses, with Cape Wickham expected to welcome its first golfers for preview rounds in March. 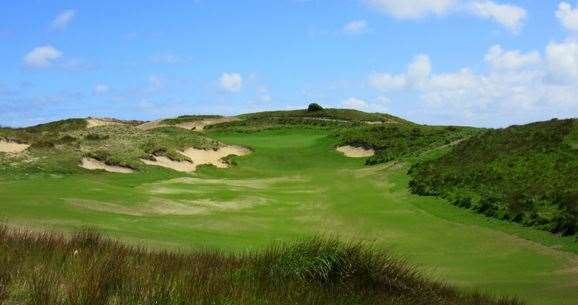 Ocean Dunes’ front nine will host golfers about the same time. 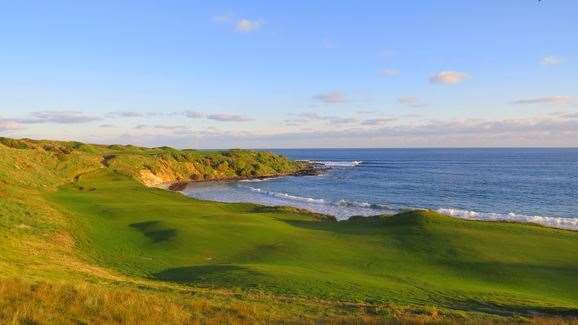 A third layout, to be located on the southern coast of the island, has been designed by Greg Norman and, given the quality of the land right across King Island, it might make it three from three for King Island in the exclusive top-100 club. “It may not happen in my lifetime but it will certainly happen … King Island could easily be the next Mecca for golfers,” says Graeme Grant, who is the driving force and designer behind the Ocean Dunes course. “It seems that everywhere you look as you travel around this island there is terrific golfing land. There has been great anticipation surrounding the Cape Wickham course since the land on which it lies was purchased in 2011 by Andrew Purchase, who helped establish Turnpoint – one of Australia’s leading golf course construction and maintenance companies. Cape Wickham is 48 kilometres north of Currie, King Island’s largest town, on the north-west tip of the island. The next 18 months involved plenty of negotiations with the King Island council regarding the layout, the environmental impact on a shearwater bird colony as well as the purchase of additional land. The adjoining land, to the south of Purchase’s title, was too good to simply ‘put in the too-hard basket’. American course designer Mike DeVries, who was introduced to the project by Melbourne golf writer Darius Oliver, agreed that the extra land would make for a better, world-class routing. Purchase realised he needed further investment to make this possible. This led to Duncan Andrews – the experienced owner of The Dunes Golf Links, on Victoria’s Mornington Peninsula – investing in the Cape Wickham project and the adjoining land was soon incorporated into DeVries’ routing. 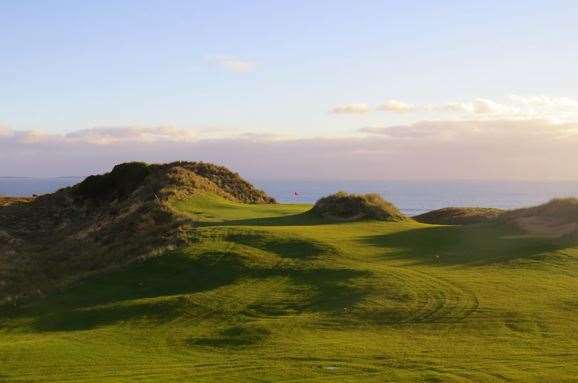 It is an outstanding routing, which features eight holes set right alongside the jagged coastline and another two where any approach shot is played towards an ocean backdrop. You can see Bass Strait from every hole. Some holes sit high above the sea, on others you can almost feel the sea spray as you peg your ball on the tee. There are holes built across rocky promontories and others, like the short par-4 18th hole, where a beach lies at the edge of the fairway. But it is the quality of the holes that lead you away from the crashing waves, over and through high dunes, which elevates Cape Wickham above many seaside courses that rely solely on million-dollar views to excite. Just when you think this layout could not get any more spectacular, you walk off a green, over a dune and down to the next tee where your jaw drops again as you take in the vista. Cape Wickham certainly has the postcard views but, more importantly for its future success, it has golfing substance. There’s no doubt the seaside holes will be the ‘pin-up’ shots for Cape Wickham, but DeVries’ easy-waking routing loses nothing when it heads inland with wide fairways and dramatic greenscapes set among the dunes. The first 13 holes cover land to the west of the proposed clubhouse, while the 14th through to 18th holes are to the east and laid out beneath the Cape Wickham lighthouse, which, at 48 metres high, is the tallest in Australia. The lighthouse is an aiming point on several blind tee shots – like the one you will face on the long par-4 4th hole where the stone structure appears to rise out of the middle of the fairway. It will come as no surprise that wind is ever-present here. The layout is exposed to the Roaring Forties, the westerly winds that whip across the Southern Ocean and into Bass Strait, and this has obviously been considered during the design process as Cape Wickham features some of the widest fairways you will find anywhere in Australia. For example, the short par-4 1st hole is wedged between dunes to the left and a cliff to the right as it heads north to the green. The fairway here is more than 50 metres at its widest and is more than accommodating even in a strong prevailing left-to-right wind. And this is where the design excels, as the best line into the large, wide green – perched high above the sea and protected in front by a deep pot bunker – is from the right half of the fairway, nearest the cliff-top. For a straight-forward short par-4 it is a fun risk-and-reward hole. If you thought the 1st fairway was broad, it hardly compares to the 2nd hole with its 80-metre wide fairway. Lying smack bang in the middle of this expanse is a pot bunker, about 230 metres from the back tee, so you need to choose a route around the bunker, depending on the pin position. The par-3 3rd hole gets you up close and personal with the ocean for the first time. Played across a rocky shore along Cape Farewell, the green is perched above the rocks and is open to a high direct approach or a lower-running left-to-right tee shot. What follows is one highlight after another – the blind tee shot to a wide fairway on the par-4 4th; the par-3 7th lying in a valley surrounded by dunes; the short and reachable downhill par-4 10th set against an ocean backdrop; the dogleg-left par-4 12th around the shoreline and the closing trio of holes, culminating in Cape Wickham’s poster hole. The par-4 18th calls for a drive to be played across the edge of the beach beside Victoria Cove. If you miss the fairway and find the beach, you may trek down there and play your next back towards the green, which might be preferable as far as misses go as the left edge of the fairway is lined by thick, grass-covered dunes. Oliver, who has collaborated with DeVries on the design for the past 18 months, calls Cape Wickham “the most spectacular site I’ve seen anywhere in the world”. I certainly can’t argue with that assessment. weave over and between sand dunes, and feature several holes along its two-kilometre stretch of ocean frontage. Ocean Dunes is the brainchild of Graeme Grant, who has more than 40 years’ experience as a greenkeeper, then a course superintendent and a course designer. Grant originally looked at the Cape Wickham site but deemed it was beyond his budget to make a world-class course work on the site. When he was outbid for that site, he looked for another high-quality location along the west coast of the island. “When I was shown this site I couldn’t believe how good it was,” Grant said. “There were golf holes to be found everywhere, not just along the shoreline but through the wide natural valleys created by the dunes. There are some very spectacular ocean holes and then you go inland to the dunes and then there’s a creek that flows through the course, so there’s a lot of variety. At the time of writing, the front nine and the 18th hole were nearing completion and nine holes will be ready for play in March. The remaining holes are expected to open later in 2015. Despite his four decades of experience, building Ocean Dunes has been a steep learning curve for Grant, who owns the course with two other investors, including golf-course builder Bernie McMahon. Ocean Dunes opens with a 500-metre par-5 that rises over the crest of a hill as it veers right, around a massive bunker, between some tall dunes and plunges down to the green set against the edge of the rocky shoreline. It’s a brilliant opener which offers several options for you to get from tee to green and, once you have reached your destination, the views up and down the coast are spectacular. Short par-4s excite all golfers and Ocean Dunes’ 280-metre 2nd hole will, in time, be regarded as one of the finest short two-shotters in the country. It is a wide driving hole but the green only opens up to those players prepared to risk placing their driving near the right edge of the fairway and the ‘Kelp Track’, that weaves along the shore. The further left you go, the more difficult the second shot approach becomes as it is a blind pitch over a bunker carved out of the face of a large dune. The shortest of the holes at Ocean Dunes will be its most talked about and is destined to feature photographically in books and calendars for years to come. The 130-metre par-3 4th hole is played across an ocean inlet with rocky edges on both sides of the water. The tee is perched just above the waves, while the expansive putting surface is very wide and features a bunker cut into the middle of the front edge. This pinches the target to its narrowest and has the effect of almost creating two greens, left and right of the bunker. The second of the par-3s that require an ocean crossing opens the back nine. The 10th hole will measure 210 metres from the back pegs and will be a daunting prospect for most. Thankfully there are a variety of teeing grounds on each hole that makes this course playable for golfers of all standards. Grant says further investment is still being sought for the project, to cover the development of a clubhouse and adjoining accommodation. “The cost of constructing the course is covered but we are still working to secure further investment,” Grant said. With news that a third course, designed by Greg Norman, is being proposed for the southern tip of the island, Grant believes it can only be a good thing for his course, Cape Wickham and King Island as a whole. “If there was one new course here it might struggle,” he said. “With 12 months we are going to have two world-class courses here on King Island, which makes it a serious golf destination that golfers will want to visit. A third course makes it even better. The golf on King Island by the end of 2015 will be outstanding and the equal of any of the highest-ranking golf destinations in this country. 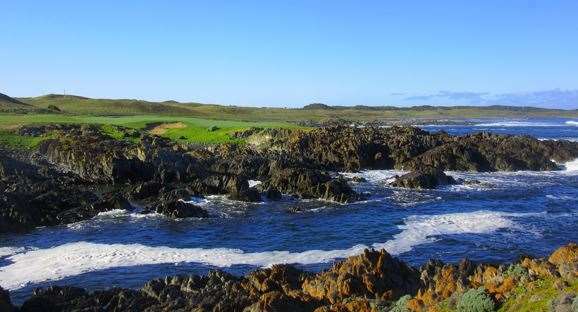 While Cape Wickham and Ocean Dunes are both laid out beside the sea, they are very different in many ways, which adds markedly to the attraction for the visiting golfer. The big winner out of this will be King Island’s economy, which has traditionally ridden on the back of its dairy and beef production. If the two courses work together to promote the island as a destination, golf tourism on King Island can prosper and both layouts will flourish.